perfect. i love pickles and monkeys, both! I think I would enjoy reading that to my boys! That is a very nice compliment! Thanks! The last stanza is a little bit difficult to read aloud, but the rest works really well. agree! it was a challenge! i was surprised when I asked one of my friends to read it out loud for the first time, and she aced it like it was meant to be read! I liked it. You have to find things you like reading. It makes it even better for my boys! Another great picture and ‘silly’ poem for your upcoming children’s book, Jodi! The monkey will bring much delight to many children. He is such a cutie. Thanks Peter! I can’t wait to put it together! Hahaha! Just adorable, Jodi! These children are going to be thrilled to see their name and namesake in this darling book! Too fun! What a great project, both for you and your friend’s families! Such joy! Mason is another adorable addition to your new children’s book. I love his expressive eyes. Love Mason. He’s adorable ! Cutest monkey I’ve ever seen! Cute one, love the details. I agree with Mason. I would pick a dill pickle over a sweet pickle. But gotta say I love a banana more than a pickle. Laughed out loud at this poem! So great! This is awesome and your pickle loving monkey is so cute and the children will love these little wonderful poems. Too good Jodi. I sure hope. ☺️. Thanks! Great expression, made an adorable card too. Poem does conjour up a pucker. Great body of work. Wonderful book. Cant wait til you try it out on your grands. So sweet, and you captured the friendly playfulness of monkeys perfectly! Oh Jodi, not only is he adorable, but your pickle poem gave me quite the tickle! It’s a little fickle 🙂 YAY! Oh, bother! Benjamin and I came back to revisit Mason, only to discover that our previous comment does not appear to be here. I remember that he “opened my email from My Jodi” on the Wednesday after you posted it. I also clearly remember writing a comment because he was so excited about a monkey with the same name as his little friend Mason and how he laughed about a monkey eating pickles instead of bananas. He told you that “I love bananas bestest!” I suppose that I failed to hit the post comment button, I’ve been guilty of that before. 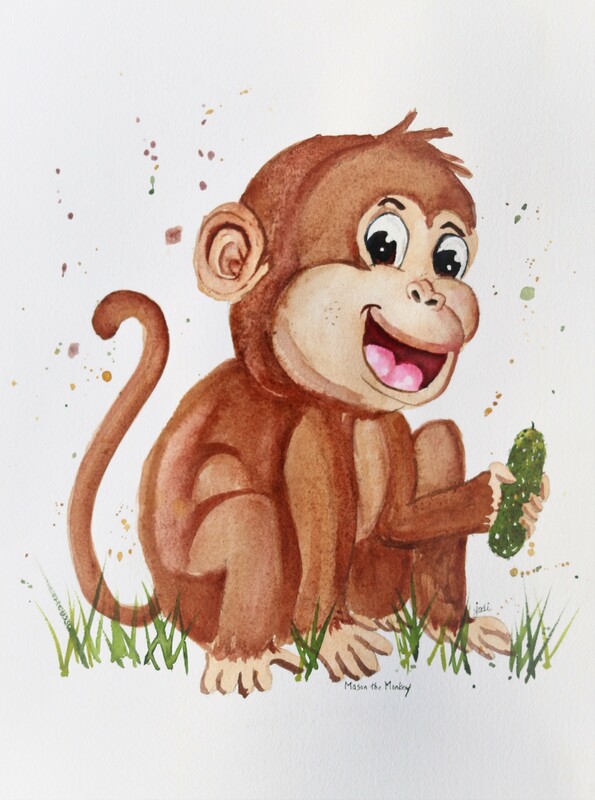 Better late than never, we love Mason the furry pickle loving monkey! Thank-you x 2! !